If you have not yet renewed your annual membership please do so as we rely on your support to stay open. The fee is just £6 for standard membership and £25 for Vice Presidents and if you are a taxpayer, please come in and sign a Gift Aid declaration so that we can claim another 25p for each pound given at no extra cost to you. 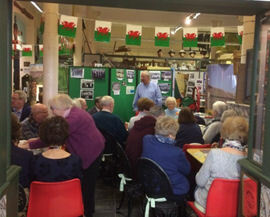 The coffee morning held on 22nd February on the subject of Jones’ Buses was very well attended, in fact Mr Alan Jones gave a very interesting talk to a packed out café! A display of Jones’ Buses photos and artefacts will remain on display until the end of March so do pop in and take a look. The second of the promotional videos made by Ben Jones is now available to view on the museum’s Facebook page. If you do not have access to Facebook but would like to see the videos, please call at the museum where one of our volunteers will be happy to help. The museum is desperately in need of volunteers to help with the daily running, from helping in the café, to cataloguing donated items, to meeting and greeting visitors. If you could spare a few hours a week to help it would be much appreciated. The ladies remembered getting ready for the dance. First you ‘rollered’ your hair and the rollers had spikes in them. Some remembered backcombing their hair to make it stand up high and then spray it with hairspray until it was stiff. One lady said she couldn’t do this as it made her taller than her husband. He didn’t like that. Then it was the make up. This consisted of a compact of face powder with a small puff that you took with you in your handbag so you could keep the shine off your face all night. One lady remembered the ‘panstick’‘'panstick’. This was a block of make up you used on your face. Eye makeup was a block of mascara which you spat on and applied with a small brush. Then there were the ‘underclothes’, such as the bras that didn’t really fit as the cups went into a point and suspender belts and stockings. Stockings had seams which were devils to keep straight but if you didn’t have any stockings you could draw a seam down the back of your leg with a pencil or gravy browning. If you got a ladder you put a blob of clear nail varnish on it to stop it running. Fortunately, tights came in during the Sixties before skirts went really short! You always wore your best dress. Jen had one she had been given from the 50s, a black fancy one with a little bolero. For the men it was a suit, tie and brylcream. The main shopping street of Newport is in a sorry state. The new Friars’ Walk shopping and entertainment complex with its cinema, ten pin bowling and laser Quest is a welcome addition to the town centre as are the many restaurants but the main street is full of empty shop units along with discount and charity stores, while the indoor market at the far end of town has a fraction of the number of stalls it used to offer. How different from my childhood days when Newport was the bustling shopping centre of choice for a day out or to buy that special outfit. The train journey there added to the excitement, despite (for us) the long walk back up Station Hill to Penybont. Wildings has recently closed its doors – a shop that had been trading in Newport since 1874. And do you remember Owen Owen? That was a department store which took over from an older department store, Reynolds, and which sat on the corner just up from Wildings. Then there was Woolworths although as we had our own ‘Woollies’ in Abertillery that wasn’t anything special at the time. More recently British Home Stores and Marks and Spencer closed their doors in Newport so fingers crossed the new Debenhams store can survive, especially as David Evans and Marks & Spencer in Cwmbran are facing closure. It’s like the loss of Bon Marche and Pontlottyn in Abertillery all those years ago. Shopping certainly isn’t what it was. Editor’s note. No it certainly isn’t Jen. I have shopped in Newport most Saturday afternoons since I was knee high and I can still be found there most Saturday afternoons today. Back in the day, Newport was so popular there would be a queue to get in the Kingsway car park, especially throughout November and December. As well as the shops you mention, I can also remember C&A, Littlewoods and the ‘In Shops’ - a sort of indoor market on the lower level of the Kingsway shopping mall and which was accessed by an escalator. Woolworths in Newport was huge and sold furniture, some of my first pieces were bought from this store! At the age of three my daughter caused panic in Wildings when she entered the lift ahead of me and, before I could follow, the doors closed and the lift was gone, but the staff were great and came to our rescue! However, now aged 28, she still doesn’t like lifts! A plan to build a road bridge across the Severn was first proposed by Thomas Telford way back in 1824 but it would be nearly a century and a half before that bridge would finally become a reality. Until the opening of the first Severn Bridge, trains were the dominant mode of travel over the Severn thanks to a railway bridge built in 1879 (more on this railway bridge next month). The original Severn Bridge spans the rivers Severn and Wye between Chepstow in Monmouthshire and Aust in South Gloucestershire. Construction on the suspension bridge began in 1963 and it took three years to build. It was opened by Queen Elizabeth II on 8th September 1966. It is just short of a mile long and was built at a cost of £8 million. It was decided that to pay for its construction, a toll would be charged, which for cars was 2s 6d (12.5p in today’s money). Originally the toll was collected on both journeys but both sets of booths, westbound and eastbound, were on the English side of the bridge. By 1989 the charge each way was £1 for cars. It was an incredible piece of engineering and made travel from South Wales to London and the South West of England so much easier. By 1977 however, with the volume of traffic much increased, weaknesses were identified in the bridge and lane restrictions were introduced. During the 1980s the bridge had to be strengthened and resurfaced to cope with the amount of traffic using it. With the first crossing under increasing strain due to the volume of traffic, it was decided to build a second Severn bridge. It was opened by Prince Charles on 5th June 1996 and this time the toll booths (which by now were only collected on entering Wales on both bridges and was £3.80 for cars), were on the Welsh side. It was seen by some as a fee to enter Wales. This bridge became known as the Second Severn Crossing until just last year when it was renamed The Prince of Wales Bridge. This second bridge was over 3 miles long, took four years to build and cost £330 million. 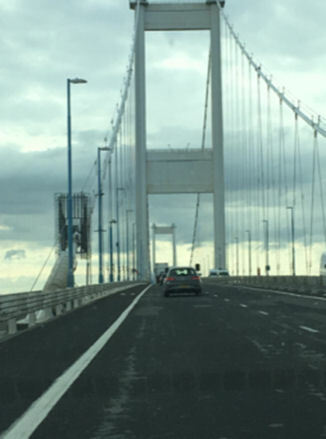 The new bridge meant the first Severn bridge, which was always part of the M4 motorway, now had to be demoted as it were, and it became the M48. On the 26th November 1999, the first Severn bridge was granted Grade I listed status. The charge to cross both bridges, having started at just 12.5p each way, peaked at £6.70 for cars in 2017, before dropping to £5.60 at the start of 2018 and on 17th December 2018 both bridges finally became free to cross for the first time ever. In 1970, on the English side of the first bridge, the Aust Motorway Services opened, operated by Top Rank. It was massive and was said to have the largest restaurant in the country. I can vividly recall many a warm Sunday afternoon when my parents would pack a picnic and together with my sister, we would jump in our car and travel down the M4, eagerly watching for our first glimpse of the huge ‘H’ shapes of the bridge. Our destination was the Aust Motorway Services. Back then though I recall that we called them ‘Motorports’ rather than services (like airports but for cars rather than planes) and we would have a lovely afternoon, sitting on the grassy bank of the River Severn with our picnic, watching the cars and lorries passing over the bridge. Then we would explore the ‘Motorport’ itself, with my sister and I spending our pocket money in one of its shops. I can remember being fascinated by the toilets because the wash hand basins (and I had never seen so many in one place) had foot operated taps – so very futuristic! Sadly, with the opening of the Second Severn Crossing in 1996, Aust services found itself isolated on the now quiet M48, cut off from its main customers. The service station is still there though it is now called ‘Severn View Services’ and is a fraction of its original size; indeed it is unrecognizable as the ‘Motorport’ I remember from my childhood. It’s that time of the year where most of our weekends are dominated by the anticipation of watching our nations play each other in the annual Six Nations tournament. Its history falls into three distinct phases which will be covered by this article. The first rugby international was played between England and Scotland in 1871. After 12 years of occasional friendly matches between the teams, the inaugural Home International Championship, comprising England, Ireland, Scotland and Wales was played in 1883. Ireland was still part of Britain at this time as it did not gain independence until 1922. England and Scotland were the most successful nations at the beginning of this period with Wales winning consecutive tournaments in 1908 and 1909. France joined the tournament officially in 1910. The tournament was suspended during World War I, a conflict which took the lives of many of the contemporary international players. The tournament resumed in 1920 but in 1932, it became the Home Nations tournament once again as France were excluded due to suspicions of professionalism. It emerged that some of their players had been receiving payments at club level and this was forbidden in a strictly amateur sport. As Ireland’s rugby union team plays under a strictly non-sectarian code which brings together Catholics and Protestants from both the now independent Republic of Ireland and Northern Ireland which was still part of the United Kingdom, they were deemed to be a home nation. The tournament was once again halted by war but as it takes place in the early months of the year, it was played in 1939. Again many of the players who played in that tournament would experience the ravages of war. It resumed in 1947 when once again France were welcomed back into the fold. France won their first shared title seven years later in 1954 and their first outright title in 1959 and by the 1970s the Five Nations had become the pre-eminent series in Northern hemisphere rugby union. Matches became all-ticket affairs, gaining huge popularity and a large television audience, however in 1972 the tournament was not finished after Scotland and Wales refused to travel to Dublin to play Ireland due to fears over security. Ireland’s first home fixture of the 1973 tournament was against England. This was a pivotal moment in the tournament’s history and before the match Willie John McBride, the captain of both Ireland and The Lions, had telephoned some of his English Lions’ colleagues to plead with them to play. England turned up to rapturous applause from the home crowd and John Pullin, England’s captain, famously said in his post-match speech that “we might not be any good but at least we turn up”. The 1973 tournament was also unique because it resulted in the only ever five way tie, with every nation having won and lost two games. The 1970s marked the golden age for Welsh rugby as they won three Grand Slams and one Triple Crown during the decade, an achievement the modern team could yet surpass having won Grand Slams in 2005, 2008 and 2012.There was no tangible reward for winning the Five Nations Championship until 1993 when a trophy was presented for the first time to the winners – who were France. Prior to 1994 teams that finished equal on points shared the Championship but from then on ties were broken by considering the points differences between the teams. Rugby union officially became a professional sport in 1995 and held its inaugural World Cup in 1997. Some believed that this new global tournament would make the Five Nations tournament less important. However, it seems to have had the opposite effect with the tournaments that fall in a World Cup year being the most intense. Scotland were the last nation to lift the Five Nations trophy in 1999 as Italy joined the following year and the Championship became a six country festival of rugby with three fixtures in each round. Far from making the tournament less competitive as some argued that professionalism would, it has actually been as competitive as any time in its history. Only Scotland and Italy have yet to win a Six Nations crown. England have won six, France have five and Ireland and Wales each have four. However professionalism brings threats and in particular the advent of subscription satellite TV. At the moment, the tournament is part of the so called “crown jewels” and so has to be broadcast on terrestrial free to air television. ITV successfully bid in 2015 to share the coverage with the BBC and this deal runs until 2021. Some fear that like the Ashes series in cricket that the Six Nations may not always be protected and fear that many of the future generations will have to subscribe to a paid TV service to watch and the potential effect that this may have on us cultivating the next generation of rugby players. But for now we can enjoy the matches on terrestrial television albeit without the dulcet tones of the late great Bill McLaren.